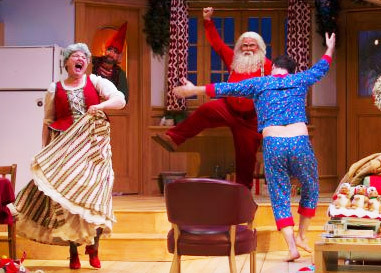 Bill Millerd reaches deep inside his Christmas stocking as the Arts Club Theatre Company presents Nicola Cavendish’s It’s Snowing on Saltspring this holiday season. Last seen in 1985 on the now closed Arts Club Seymour Street stage, It’s Snowing on Saltspring has thankfully been updated with some current references (guess which Russian president is on Santa’s naughty list this year?) but its basic story remains intact. Saltspring tells the story of the Bannisters who have given up life in the big city for a quieter existence on the Island after Bill, a dentist, has a breakdown from having worked at a job with one of the highest suicide rates. With an overdue baby and a lack of direction in his life, Bill relapses to his days of stress shoplifting and starts to get a major case of cold feet about the possibility of parenthood. In his current funk Bill gobbles down boxes of Viva Puffs, wishes for pizza rather than turkey and proudly unveils one of the oddest crèches this side of South Park. Ending up on the couch on Christmas Eve after a fight with his wife, it takes an overnight trip to the North Pole for Bill to finally realize the true meaning of the holidays. With the exception of Andrew McNee, who wonderfully flips between the droll and depressed dentist to the wide-eyed enthusiasm of his inner child, the other actors in Cavendish’s story play double-duty, reminiscent of Dorothy’s encounters on her visit to Oz and where the bulk of the silliness takes place.